Add a unique design to your bar area with the Kite Wooden Stool Grey. This design is truly innovative and will be sure to turn heads in your home. A creative model with legions of pizzazz, the Kite is ideal for both modern and rustic interiors. 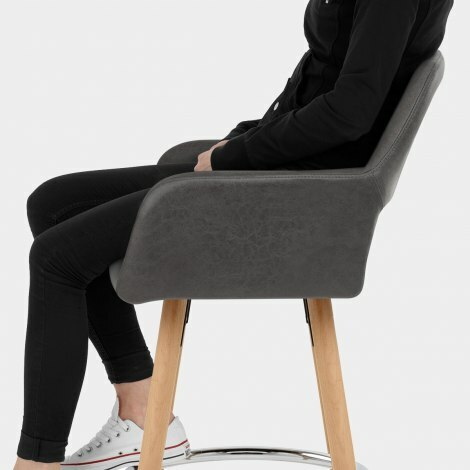 Upholstered in grey faux leather, the padded seat includes supportive armrests and a cut out detail in the high backrest that helps to maximise visual space. 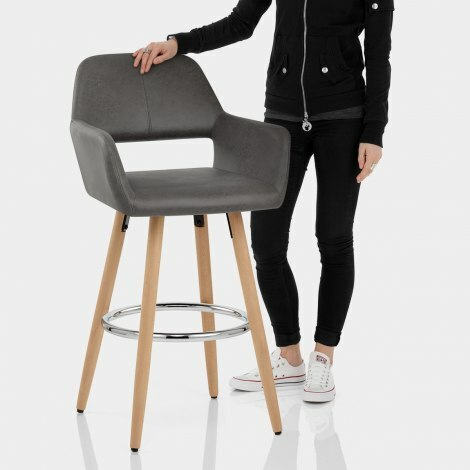 Not only that, the seat also has a 360-degree swivel feature for easy access to and from your bar, which is unique to our fixed height designs. The frame is made up of four oak finished legs and the circular chrome bracing bar strengthens the design. Complete with adjustable protective floor plugs, this is a versatile piece with both style and practicality. "I am so happy with these stools"
Very nice stools, liked by all the family. Assembly relatively easy too! Excellent stools - very pleased with them and delivered next day. These beautiful, comfortable stools are the final touches in our kitchen offering superior comfort, high backs, and elegant design. I am so happy with them and may order another. Excellent service, packaging, delivery products.